I used to enjoy doing custom work and this page will show some of the pedals that I have built over the years. The Rampage Menace Spitting Out Fire is one of my all time favorite builds. 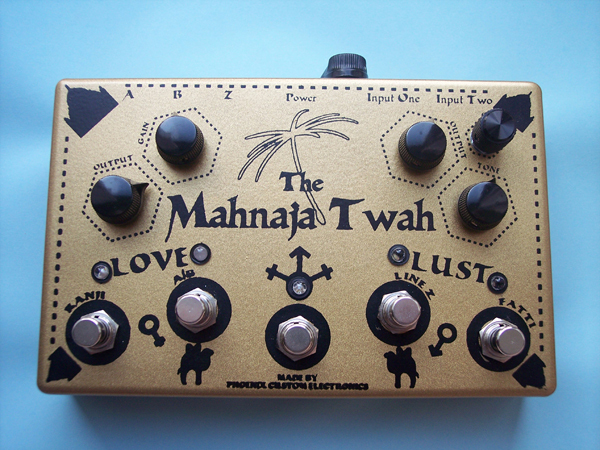 It’s basically a Lady Stardust with a fixed wah and a Ranger attached. There is a youtube review of it here. I actually think that the review does not quite do the pedal justice. This thing is really over the top! I built it for a customer in Japan. The customer who ordered this pedal wrote the testimonial below. 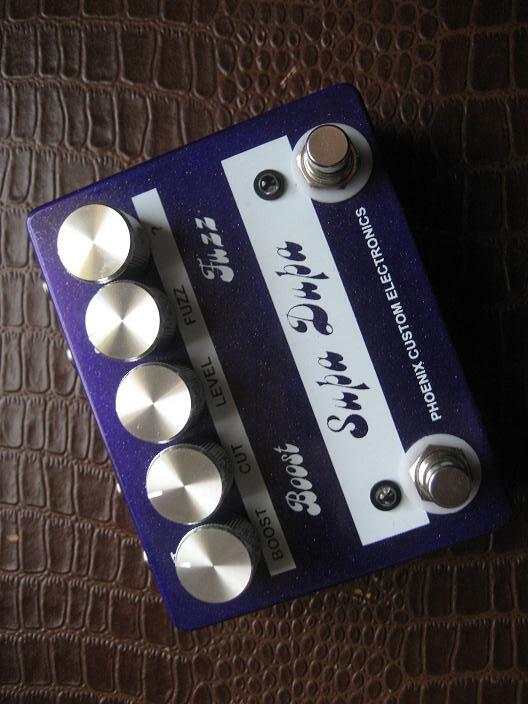 I’m not sure that I am actually a “star in the boutique stomp box biz,” but that’s OK. To build this pedal I had to learn how to use a laser etcher. So now I can etch rather than screen print which will be cheaper for one-off designs! I have been using Phoenix Custom Electronics stomp boxes for over 10 years. 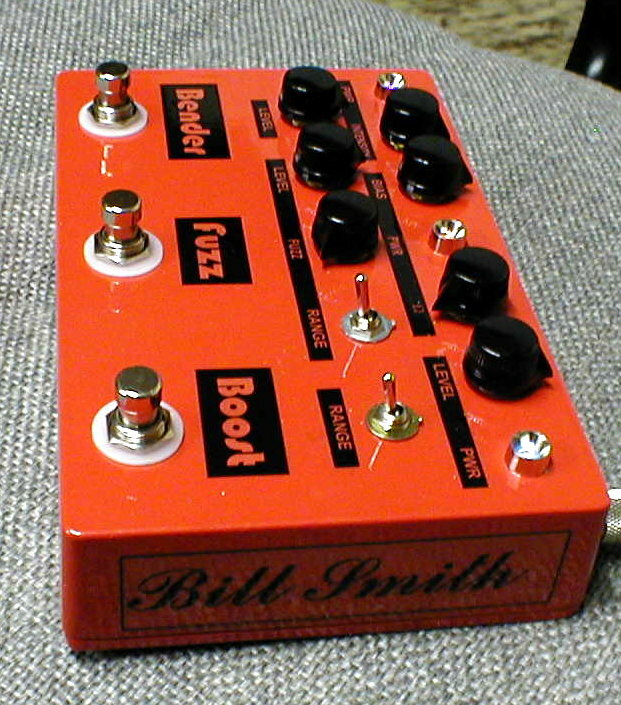 In fact, about five years ago Alex made me a three pedal stomp box that I loved – It has a permanent place on one of my live rigs, and it’s my “Go To” pedal when jamming with friends or at an open jam, that sort of thing. However, as the years have gone by, I started to figure comfort and reliability into my stage rig. Cords go bad, pedals are not convenient to re-order once mounted on a pedal board, and once you get all the nifty toys on board, the bloody thing is just heavy! So I called Alex and told him I wanted an all-in-one multiple effect stomp box. He asked me, “Why?” I simply said, “Less to Lug Around and Go Wrong”. And so a 7 month odyssey began which culminated in a wonderfully compact, reliable, light, and hot smokin’ tone monster Alex dubbed the “Less to Lug Around and Go Wrong” pedal. 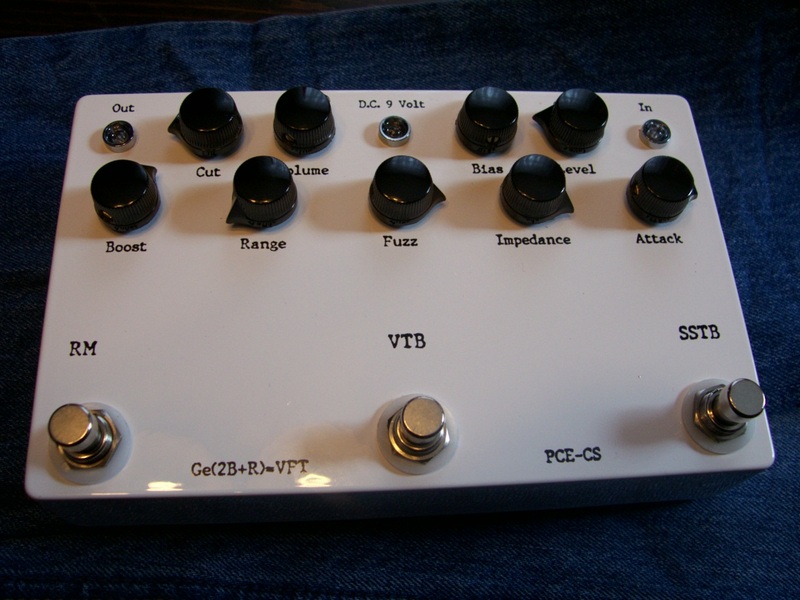 As you can see, it has all the original PCE pedals which made Alex a star in the boutique stomp box biz. But also included were several “clones” of some others I can’t live without, such as a Boss DS-1 and a Tube Screamer. The LTLAAGW boasts two amp outputs, and an in-out for every effect in the chain for easy re-rodering. 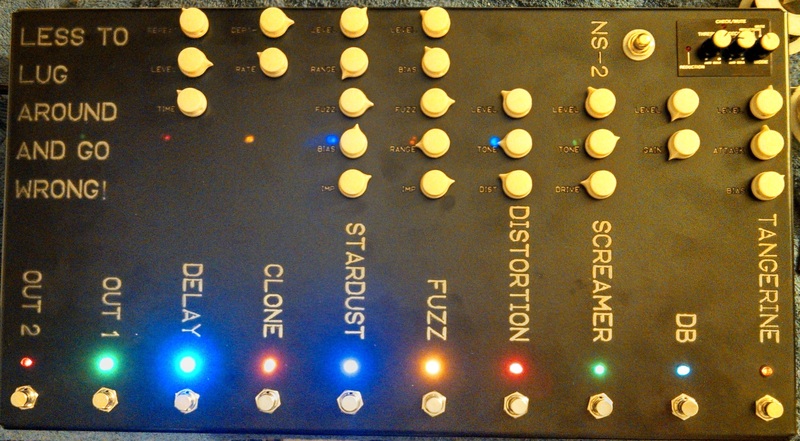 Alex even took my trusty Boss NS-1 and mounted it inside the box making my little gem complete. 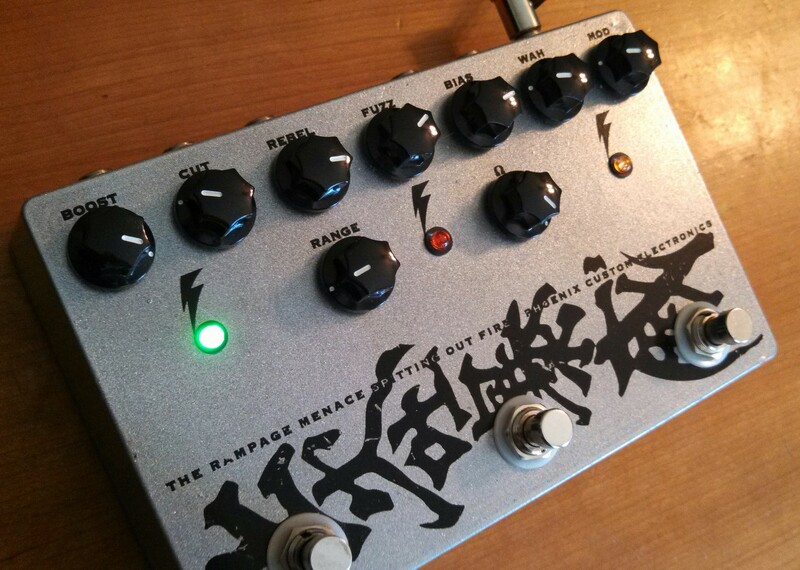 There is also an in – out for the noise suppression so I can connect other pedals thru the chain with noise reduction. Alex and I collaborated every step of the way, and I must say the process was nearly as much fun as playing the darn thing. This heirloom piece is a permanent part of my collection (namely because Alex etched a dandy inscription and my name on the bottom of the darn thing). I will treasure it forever!! 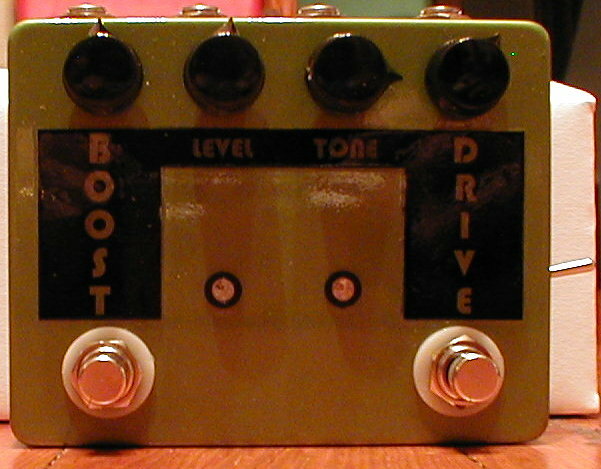 The SupaDupa Fuzz is designed to accomodate a fuzz and a boost. It can be built with any fuzz/boost combination. And it looks sharp! A custom AB/Y box with boosts. The second Equation Pedal – Lady Stardust, Tone Bender MKII, and Ranger. An Early double pedal from back when I used to label them with clear laser labels. Basically a Tube Screamer and a Boost! 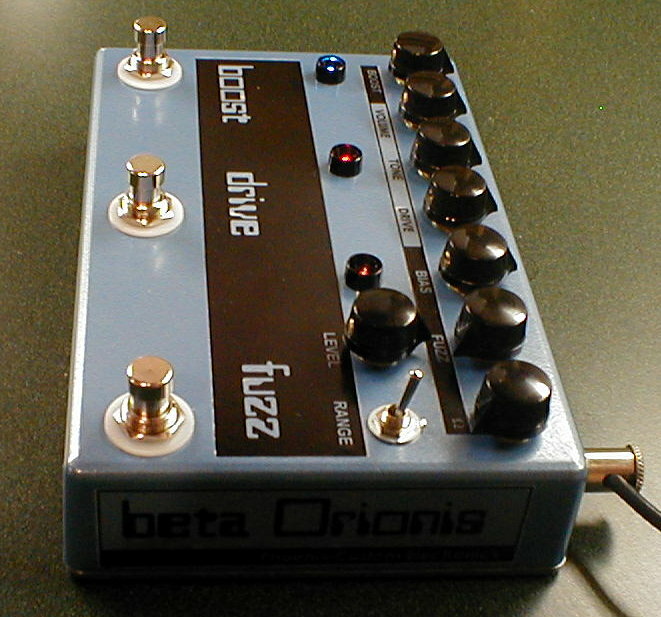 Beta Orionis – A Tube Screamer meets a silicon Fuzz and Ranger.